It may seem like a foregone conclusion, but why is firing a gun fun? Why is driving a car at high speeds around a track exciting? What's exhilarating about the charge of horses or the roar of cannon fire? These are the questions that designers ask themselves when they begin to work on a game. Unfortunately, when creating experiences for players, we designers frequently spring to ivory tower answers to these questions. We say things like "guns fulfill a power fantasy" or "the feeling of speed plays on ancient predator/prey instincts," but I'm not sure that's good enough. Yes, human psychology is a vital part of game design - I'd even go so far as to say that it's impossible to design a good game without considering the psychology of the player - but designing experiences without partaking in those experiences (where possible) seems like taking the easy way out. Ever hear the old adage "write what you know"? 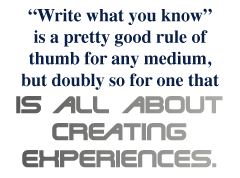 It's a pretty good rule of thumb for any medium, but doubly so for one that is all about creating experiences. Of course, many game designers work on projects that involve subjects way outside their realms of experience. This is where Method Design comes in. Method Design is the practice of living the experiences you design to help you better convey that experience to players. But merely living an experience is not nearly enough to make it useful for designing a game; it requires careful introspection and a very specific way of observing your experiences. This is the heart of the Method. 1. Don't look for realism. Instead, discover where reality and expectations don't jibe. When making games, we are not looking to mimic reality - even at its most exciting, reality is rarely fun enough to make a good game. Instead, we are looking to craft the apotheosis of a fantasy. In order to do this, we have to train ourselves to be keenly aware of the low points of an experience.